As a minister in the United Methodist Church, a denomination that is deeply divided over how we are to be in relationship with our sisters and brothers who are LGBTQI, I have on more than one occasion heard persons who are in favor of the current exclusionary language of the Book of Discipline of the United Methodist Church say that they hold to their beliefs because they are “just trying to be faithful.” The implication is that their faithfulness is somehow tied to their holding the belief that people who are LGBTQI are living lives that are incompatible with Christian teaching and that their faithfulness is somehow tied to keeping persons who are LGBTQI from participating in the full life and ministry of the church by not allowing them to be married in the church or to serve as ordained ministers. This year multiple annual conferences decided to no longer conform to the exclusionary language and practices prescribed by the United Methodist Book of Discipline. They decided to celebrate marriage equality by joyously including all persons in the gift of community by having their vows of marriage celebrated within their churches. And they decided never to use sexual orientation or gender identity as a factor in decisions about ordination of clergy. This week the Western Jurisdiction of the United Methodist Church elected and consecrated Rev. 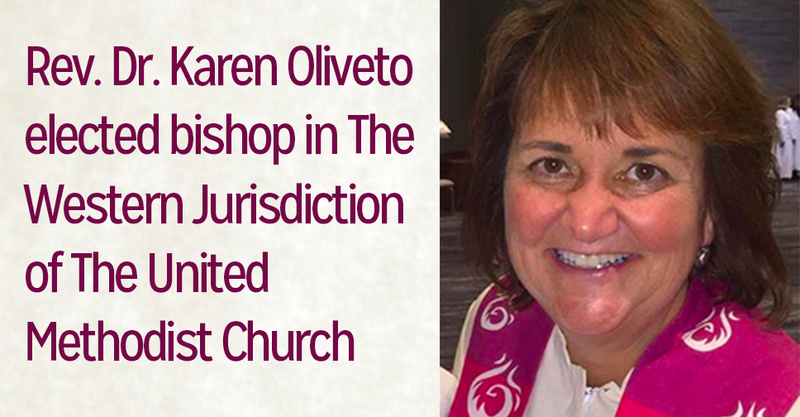 Karen Oliveto as bishop. She is the first openly lesbian clergy person to be a United Methodist Bishop. For many of the persons who see adherence to the exclusionary language and exclusionary practices in relation to persons who are LGBTQI as an expression of their faithfulness, there is a perception that the conferences and jurisdictions who are ignoring these exclusionary practices somehow are not being faithful. They are creating a crisis in the denomination, a break in the covenant that they see as binding the clergy in the church to continue to practice the exclusion that the Book of Discipline prescribes. “When ‘just being faithful’ becomes justification for treating others unjustly, just exactly to what is one being faithful?” It seems that the “just” in the words “we are just being faithful” rarely has anything to do with justice, and too often these words are used to perpetuate injustice. As we move forward in the United Methodist Church seeking to do justly, to love kindness, and walk humbly with our God, an important measure for “just being faithful” is to discern whether we are actually practicing a just faith. As a United Methodist minister in the South Central Jurisdiction, I give thanks to the witness of the Western Jurisdiction of the United Methodist Church. May we all live and love into your witness of nonconformity in response to injustice against our sisters and brothers who are LGBTQIA. This entry was posted in LGBTQIA, marriage equality, religion and tagged LGBTQIA, marriage equality, United Methodist Church. Bookmark the permalink. 5 Responses to Just Being Faithful? What is love? It seems to me that’s the most important part of discerning who is loving and who is not loving. If love is, as I would posit, conforming oneself to the will of God, then what is loving is what God commands, as bleak, counter-cultural, and unintuitive as that may seem. Yet, if one’s understanding of what God commands about sexual orientation and gender identification is grounded in cultural interpretations from thousands of years ago that found expression in some of our scriptures, then one may not actually be counter-cultural but simply conforming to a cultural tradition that no longer resonates with reason and experience and is not an expression of compassion and justice. Will the words of Jesus ever no longer resonate with reason and experience and we should abandon them? What do you mean by, “the words of Jesus”?